Hackney London Borough Council is the local government authority for the London Borough of Hackney, London, England, one of 32 London borough councils. The council is unusual in the United Kingdom local government system in that its executive function is controlled by a directly elected mayor of Hackney, currently Philip Glanville of the Labour Party. Hackney comprises 19 wards, each electing three Councillors. Following the May 2018 election, Hackney London Borough Council consists of 52 Labour Party councillors and 5 Conservative Party councillors. The council was created by the London Government Act 1963 whereby it replaced three local authorities: Hackney Metropolitan Borough Council, Shoreditch Metropolitan Borough Council and Stoke Newington Metropolitan Borough Council. There have previously been a number of local authorities responsible for the Hackney area. The current local authority was first elected in 1964, a year before formally coming into its powers and prior to the creation of the London Borough of Hackney on 1 April 1965. Hackney London Borough Council replaced Hackney Metropolitan Borough Council, Shoreditch Metropolitan Borough Council and Stoke Newington Metropolitan Borough Council. All three had been created in 1900; the ancient parishes of Hackney and Stoke Newington were previously governed by vestries, but together were united as the Hackney District of the Metropolis from 1855 to 1894. Shoreditch was also an ancient parish and was governed by a vestry until becoming a metropolitan borough in 1900. 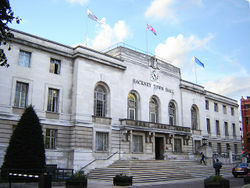 It envisaged through the London Government Act 1963 that Hackney as a London local authority would share power with the Greater London Council. The split of powers and functions meant that the Greater London Council was responsible for "wide area" services such as fire, ambulance, flood prevention, and refuse disposal; with the local authorities responsible for "personal" services such as social care, libraries, cemeteries and refuse collection. This arrangement lasted until 1986 when Hackney London Borough Council gained responsibility for some services that had been provided by the Greater London Council, such as waste disposal. Hackney became an education authority in 1990. Since 2000 the Greater London Authority has taken some responsibility for highways and planning control from the council, but within the English local government system the council remains a "most purpose" authority in terms of the available range of powers and functions. Wards were established for Hackney when it came into existence on 1 April 1965. The first elections of ward councillors took place in 1964. These boundaries were also used for the 1968, 1971 and 1974 elections. For the 1978 elections the ward boundaries were revised. These boundaries were then also used at the 1982, 1986 and 1990 elections. For the May 1994 elections there were minor adjustments to London borough boundaries, which affected the area and population of some Hackney wards. These boundaries were also used at the 1998 elections. The current ward boundaries came into effect at the May 2002 elections. They were also used at the 2006 and 2010 elections. The ward boundaries were redrawn for the 2014 election. Hackney London Borough Council is the billing authority for Council Tax, and collects a precepts on behalf of the Mayor's Office for Policing and Crime, the London Fire and Emergency Planning Authority the Greater London Authority and Transport for London.